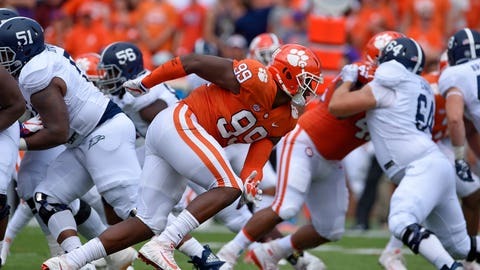 Clelin Ferrell’s pass-rushing prowess has helped put No. 2 Clemson on the cusp of its fourth consecutive Atlantic Coast Conference championship and another berth in the College Football Playoff. Having defensive difference-makers has helped Syracuse (8-2) to the No. 12 ranking in the Top 25 — its highest since September 1998 — while BC (7-3) is 22nd. Hall jokes that Thornhill steals his interceptions, but adds that it’s because his fellow Cavalier is all over the field. There’s no underestimating the value coaches place on a player with a keen instinct for the ball, such as the Seminoles’ Burns. “He’s smart, first of all,” Florida State defensive coordinator Harlon Barnett Barnett said. “A smart football player allows you to be an even better football player on all levels. If you have a great understanding of your opponent — the guy across from you and the scheme — and understanding certain situations (where) they like to do this and certain situations they like to do that. … Now, your game can go to another level. The Tigers are tied for No. 1 nationally in scoring defense at 12.7 points per game and ranks second in yardage allowed at 253.6 yards per game. Clemson defensive coordinator Brent Venables stresses to players the importance of putting the team first, but said it’s not a hard sell.